Milwaukee's M12 Cordless High Performance Jig Saw is the most compact, lightest weight professional cordless jig saw on the market. 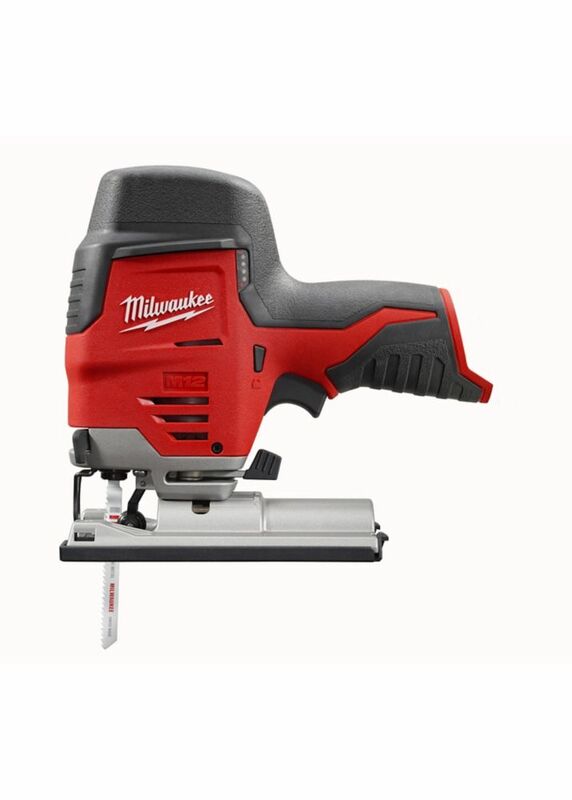 Powered by the M12 RED LITHIUM battery system, the tool is ideal for trim carpenters, remodelers, cabinet/countertop installers, plumbers, electricians, and HVAC professionals for making quick cuts in wood, metal, wall tile, or plastics without the hassle of pulling out a cord. The Hybrid Grip handle design combines the best features from both top handle and barrel grip jig saws to provide superior cut control. The low center of gravity grip is ideal for precision during curved cutting applications. The M12 Jig Saw is designed to minimize vibration by using a fully counterbalanced mechanism and positioning the limited tool weight directly over the cutting area. Backed by Milwaukee's<sup></sup> 5-year warranty the 2445-20 comes equipped with (1) 10 TPI wood cutting blade, anti-splintering insert, and non-marring shoe. Our 20V MAX XR Cordless Barrel Grip Jig Saw features an efficient motor for powerful performance and extreme runtime. Precisely control blade speed up to 3,200 spm with the variable speed trigger and dial, for professional results no matter what you're cutting. 4-position orbital action lets you adjust for optimal cutting of a variety of materials. A bright LED light illuminates dim work surfaces and makes it easy to follow cut lines. The updated all-metal, lever-action keyless blade clamp is designed for quick and easy blade changes of t-shank jig saw blades. Also keyless, the shoe bevel is easy to adjust with detents at 0-degree, 15-degree, 30-degree, and a positive stop at 45-degree. A removable shoe cover helps protect materials from scratches, and an integrated dust blower helps remove dust and debris from your line of sight as you cut. Electric brake stops blade immediately for added safety; Independent dust nozzle doesn't require removal when bevel cutting and adapts quickly and easily to Makita Dust Extractors; Blower feature keeps cutting line free of saw dust; LED job light illuminates cutting area; 3 orbital and straight-cutting options enable operator to obtain a more aggressive cut; Ergonomic soft rubber grip design for vibration absorption and comfortable operation. M12 12V Lithium-Ion Cordless Jig Saw (Tool-Only) Milwaukee's M12 Cordless High Performance Jig Saw is the most compact, lightest weight professional cordless jig saw on the market. Powered by the M12 RED LITHIUM battery system, the tool is ideal for trim carpenters, remodelers, cabinet/countertop installers, plumbers, electricians, and HVAC professionals for making quick cuts in wood, metal, wall tile, or plastics without the hassle of pulling out a cord. The Hybrid Grip handle design combines the best features from both top handle and barrel grip jig saws to provide superior cut control. The low center of gravity grip is ideal for precision during curved cutting applications. The M12 Jig Saw is designed to minimize vibration by using a fully counterbalanced mechanism and positioning the limited tool weight directly over the cutting area. Backed by Milwaukee's<sup></sup> 5-year warranty the 2445-20 comes equipped with (1) 10 TPI wood cutting blade, anti-splintering insert, and non-marring shoe. M12 12V Lithium-Ion Cordless Jig Saw (Tool-Only) is rated 4.5 out of 5 by 179. Rated 5 out of 5 by Griz from This jigsaw is so lightweight , another excellent product from milwaukee, I've only had the prod... This jigsaw is so lightweight , another excellent product from milwaukee, I've only had the product for a week but it has performed every day . Wow does it ever meet my expectations. Rated 5 out of 5 by HomeDepotCustomer from It's light weight and compact design make it easy to... It's light weight and compact design make it easy to get into small areas. You would think the 12 volt battery would have a hard time keeping up with the demand of cuts but it actually does quite well after several hours of work. i was impressed. Definitely worth the expense. Rated 5 out of 5 by Al from Very pleased. ... Very pleased. Rated 5 out of 5 by Cameronmcgroarty from I like the compact size. Good power and ran... I like the compact size. Good power and ran all day on an M12 6.0 battery cutting in a sink, pocket door hardware, counter scribing etc. Feels great doing detail work without a cord trying to steer your tool the weong way. I recommend 3.0ah battery or larger. Does &quot;Bare Tool&quot; include the battery described? Can you use this to cut drywalls.